Way of the Dodo: Butterfly, Little Ear, al Limone. 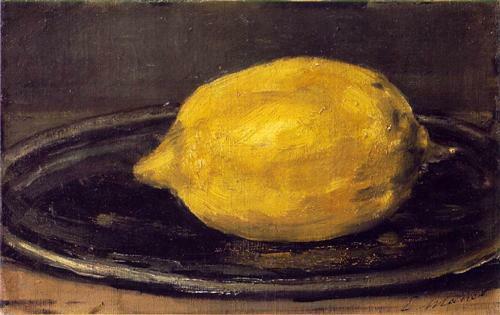 The Lemon, Edouard Manet, oil on canvas, 1880. In the collection of the Musée d'Orsay, Paris France. Wonder at this amazing film of a factory machine making farfalle. In the time it took to watch that you could have made some by hand, so here is a super snappy clip of making pasta dough, exactly as we do it here, at the Dodo. But that is not all: Watch this woman's hands fly in Bari! And here is a clip that demonstrates a little more fully how to work that magic. One more thing, a recipe: spaghetti al limone. You can even use a packet of spaghetti, made by the big machine which is operated by the big company, because imagining that Sophia Loren wants you to eat it will make up for how little you touched or handled the noodles. I think, however, if she was to dine tonight, at your home, you might find the time to get your hands into the dough. Your own dinner might be worth as much effort as that, no?